In a hugely successful weekend for Galway athletes, Sean Breathnach and Alanna Lally both won titles at the National Track and Field Indoor Championships in Dublin. 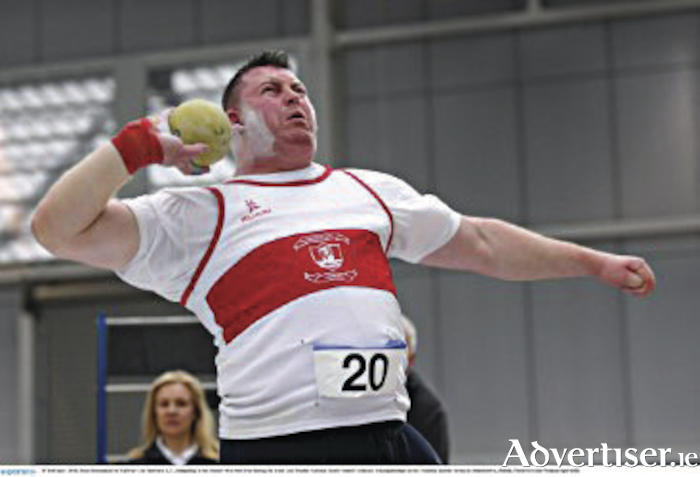 Sean Breathnach of Galway City Harriers took yet another national shot putt title, and set a new national indoor record of 18.30m in gold after an enthralling competition. Breathnach had a great battle with the up-and-coming John Kelly (Finn Valley AC ) who led early on with a best throw of 17.53m, which ultimately gave him second to another champion's performance from the Connemara man Breathnach. Galway’s Alanna Lally, now with UCD AC, won her first national senior title in the women’s 800m. She dominated from the gun to take gold in 2:08.71. Jerry Keary of Craughwell AC also took his first national senior medal, claiming silver in the men’s high jump with a 1.90m leap. Other notable Galway performances came from Veronica Burke of Ballinasloe and District AC, who placed fourth in the women's 3k walk, and Sinead Gaffney of Craughwell AC, who made the 800m final, placing eighth and running a club record 2.19. GCH’s multi-eventer Michael Breathnach competed in five events, with a best finish of fourth in the shot putt, behind brother Sean, while Brendan Staunton of GCH was seventh overall in the shot final. NUIG athlete Damien Landers placed fifth in the men’s 1500m, competing for Ennis Track AC.